The Greek mainland, at the southernmost tip of the Balkan peninsula, is bordered by the two seas of the Ionian and the Aegean. Over 2000 islands lie within Greek waters but only about a hundred are inhabited. Each island has its own unique history and character. The distinct beauty of Greece is to be found in a variety of contrasts. Off the West coast of mainland Greece lie six islands of the distinct Ionian group:Corfu,Paxos,Lefkas,Kefalonia,Ithaca and Zakynthos; Kythira, the seventh island lies further south as a gateway to the Aegean. With the exception of Lefkas the Ionian islands escaped the occupation of the Ottoman Turks, but came under Venetian rule for almost six hundred years until 1797. Their union to Greece was finally granted after seventy-five years of French, Russian and British protection. Anglo-Venetian architecture is evident in Ionian churches, schools, castles and houses with delicately shaped arches, imaginative wrought ironwork and the gentle slope of red tiled rooftops. The Ionian landscape is a rich green of olive, pine and cypress with a Spring and Autumn carpet of grass, bracken and wild flowers. Off the East coast of the Pelion peninsula of mainland Greece are the Sporades islands of Skiathos,Skopelos,Alonissos and Skyros. The islands were part of a thirteenth century Byzantine Empire and have retained the beautifully crafted churches of that period. A Venetian occupation was followed by an overpowering Ottoman Empire until the islands were granted reunion to Greece in 1830. Skiathos, Skopelos and Alonissos are richly forested with pine and olive, and share a similar landscape of cultivated hillsides which overlook sparkling beaches of sand and pebble. Crete, the largest of the Greek islands and cradle of early Mediterranean civilisation, has a fascinating combination of rugged mountains, vineyards, citrus groves, forgotten ruins and isolated chapels. The coastline offers many good sandy beaches. Painters and poets have been inspired by the island’s varied scenery, the distinctive character of its people and its impressive archaeological remains, which date from different periods of its history: Minoan palaces, Byzantine churches, Venetian castles and Turkish minarets. The Greek islands have a great variety of things to see and do while you are there. On most islands varied excursions are offered by local agents and one can find sporting activities such as waterskiing, tennis, scuba diving and mountain biking. On each island within our programme it is possible and enjoyable to explore on one’s own, as opposed to an over-organised coach excursion, and discover deserted hamlets, stone threshing floors, ancient churches, wine and olive presses, unusual flora, simple farms and hidden paths leading to spectacular vantage points. On Skopelos, our agent George Drossou is able to introduce private parties to the fascinating history of the island’s town with a guided walk and anecdotes based on his family’s long involvement with the island. On Alonissos, Chris Browne, who has lived on the island for many years, organises a series of walks for small groups wanting to enjoy an educated yet informal introduction to the island’s natural and social history. 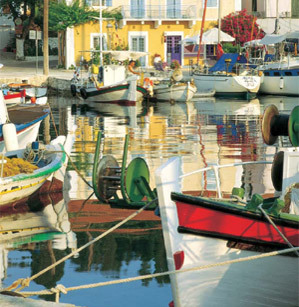 On Paxos, , one can take a guided walk on the harbour islet of St. Nicholas Island with a visit to the old castle. On Ithaca, Katrina Parsey is an English poet with a passion for exploring Greek islands on foot.Katrina has lived on Ithaca for the past eleven years. Daily walks, averaging four hours in total, will introduce Ithaca’s more inquisitive visitor to the island’s history, mythology, flora and fauna. From Paxos and Corfu there are now one or three day excursions to Albania. From Fiscardo there are intriguing Marine Expeditions and dolphin-watching tours, arranged by a local environmental society. On Crete our local agents have personalised directions to many of the hidden treasures of the island.